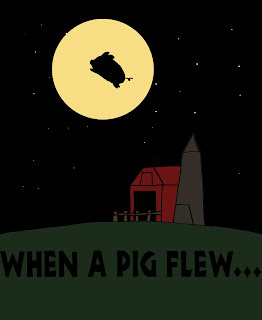 When people say “When pigs fly” what they really mean is “never” because, as we all know, pigs cannot fly. But the next time someone tells you something will only happen “when pigs fly,” you might want to inform them that this has already happened, and tell them all about Tracey. Tracey was a pig. And like many other pigs, she had her hopes and dreams and ambitions. Her greatest dream was to fly. All her life she had watched the birds flying overhead and wondered what it must be like. She even tried flying herself. She climbed up onto a bale of hay and jumped, but that didn’t work. She tried running and jumping into the wind, but that didn’t work. Once she even persuaded a flock of geese to try lifting her up off the ground….that one didn’t really go well for anyone involved. Tracey looked and, indeed, there was an enormous forest just outside the farm. Funny how she’d never noticed it before. And what happened to Tracey in the woods? Did she ever get to fly? Are there or are there not any monkeys in this story? The answer to these and other questions can be found by reading the full story HERE (And, yes, there are monkeys).